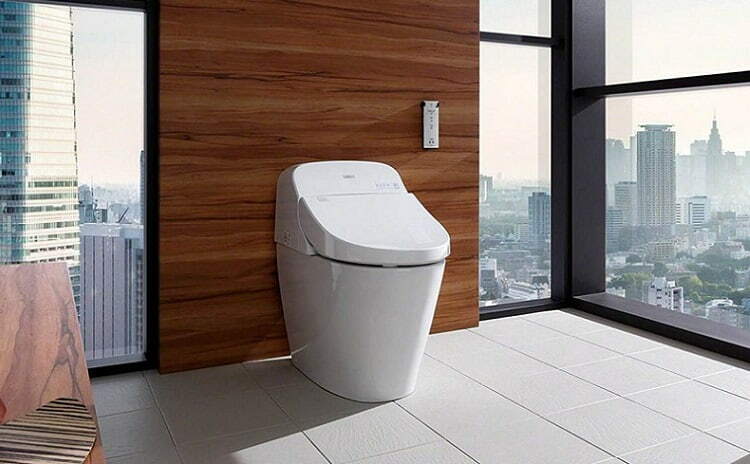 A modern bathroom isn’t complete without a modern Toto toilet. There are thousands of these toilets in the market today, presenting you with the headache of which model to choose over the rest. In this review article, we have relieved you the burden of making hard choices by sampling the top ten best Toto toilets based on their cost, size, flush efficiency, user comfort, and tech application. Before proceeding to the main article, it is worth noting that no product can reach 100% in perfection. For the ten Toto toilets below, a lot of emphases is on their unique features and their most glaring shortcomings. Why are Toto Toilets the Best? With the seat in place, TOTO CST454CEFG toilet is about 19 inches from the ground and without it, the height drops to 16.5 inches. This ensures that there is a continuous blood flow through your legs whenever you use this toilet, your height notwithstanding. It’s rough in is approximately 12 inches in size while the tank is approximately 30 inches high from the floor. It has a sanagloss finish meaning that the toilet bowl doesn’t attract much debris. This makes it easy to clean with just a nonabrasive brush, a disinfectant, and literally any toilet cleaner at your disposal. The tank lid curves inwards at an insignificantly small angle thus making it a perfect surface to place items such as toilet paper. With a dual flush mechanism, this toilet will give you an unbelievably quick and quiet flush that takes everything with it in one go. The tank releases less than 1.5 gallons per flush thus saving water. There are lots of installation videos online so just about an hour or so is all you need to set-up this toilet on your own. The toilet doesn’t come with bolts, wax seal, nor the seat. 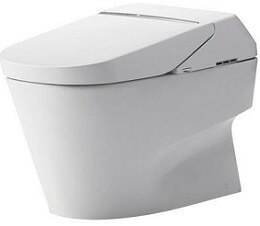 Unlike other toilets of its kind, TOTO MS604114CEFG toilet is delivered together with its seat. The seat is slightly over an inch thick and whose SoftClose hinge system makes it super easy to use. Its bowl is elongated to make it highly clog-resistant, while high-tech flushing system ensures that the bowl is cleaned easier and faster. The modern tech flush mechanism also means that a single press (a couple of seconds) on the flush handle will get the job done you don’t have to keep pressing on it continuously. This toilet measures 27″ deep x 17″ wide and complies with ADA height regulations. Being cotton white, this toilet will most likely match with your bathroom colors including most bath tab brands. You will need to purchase two bolts that you will then use to screw the toilet to the floor. With the many instructional videos available on YouTube, this shouldn’t be much of a hustle. What’s more, the toilet sits well on the floor drain meaning that you will not need to install any outlet connectors. You will need to order a wax toilet ring separately. Toto CST474CEFGNo.01 toilet’s rim is 17 3/4 inches high while the tank is 30 inches from the floor. It comes with a 12-inch rough in but you can always substitute it with a 10″ or a 14″ rough-in if need be. The flushing mechanism employs the tornado flushing technology which releases about 1.28 GPF of water at a pressure of 8psi per flush. That’s powerful enough to carry bacteria and clogging debris with it down the waste line. If you need to replace any part be it the flush handle, seat, tank lid etc. the accessories aren’t the hardest to find. Its bowl is 28.5 inches long, complementing the rounded tank that is designed to give the user a comfortable sitting posture. Due to its sanagloss finish, you can wash this toilet with any mild washing detergent out there and a soft brush. For the installation process, it will take you an hour to two hours to have it in place. The packaging is amazing and, if you have any questions or complaints after the purchase, the customer service is awesome. This item doesn’t include a close lid nor the seat. The unique features in this toilet include an automatic double cyclone flushing mechanism and a beautiful skirted design. The lid is fitted with a highly sensitive infra-red sensor that detects your movements the moment you enters the bathroom and automatically flips the lid open, then closes once your business is done. Besides that, it has a heating and cooling mechanism that adjusts the seat’s temperature with changes in the room temperature. With the lid closed, this toilet is about 18 inches high from the floor. This toilet takes luxury to another level with its inbuilt heater that automatically heats cold water from the inlet; you will not need a hot water inlet anymore once you install the toilet. It also comes with a remote for a more comfortable use. With a 700H owner’s manual, you will find the installation process extremely easy and after that, whenever you need assistance in its usage, the manual will come in handy. When power outage rocks your home or when the sensor and remote misbehaves, the toilet has a manual flush button as a substitute. It’s expensive but with all its luxury, this can be overlooked. Weighing at only about 66.5 pounds, this is among the easiest toilets to install. The toilet hangs nicely on the bathroom wall and, when the need arises, you can use it as a portable toilet for your kid to use around the house. It has a second level flush system which sufficiently cleans the bowl, leaving you with only a little scrubbing to do. You can clean this toilet using any of the conventional cleaning detergents. The tank is wall mounted and fills up quicker than most TOTO tanks and gives you an admirable water economy too. Added a different feature of this product is its quiet flushing. Although you will need to buy a seat separately, the toilet is compatible with nearly all elongated toilet seats sold at your local store. The seat measures 21″ by 14.2″ and has a customizable height; it is for you to ensure that your installation complies with the ADA height specifications 19 inches maximum. The bowl doesn’t feature a SanaGloss finish. Works best with an in-wall toilet tank system, which you will have to order separately. This TOTO toilet is ADA compliant one-piece toilet. 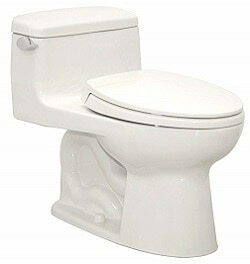 Soiree toilet is a universal height, 12-inch unit rough-in, and a chrome inbuilt lever feature. The Sanagloss ceramic glaze makes the toilet last longer and provides protection. 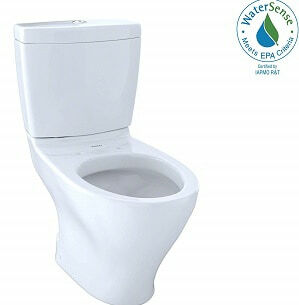 It is generally a low consumption toilet (4.8Lpf/ 128 Gpf). It is built with a two cyclone system for flushing. The front bowl is elongated and is fitted with a SoftClose seat. The toilet works just like its name suggests, cyclone. The flushing system leverages on the power of gravity and water to create a very powerful 128Gpf that makes it clean perfectly well. Instead of a rim hole, it has two nozzles, which provides for better cleaning and efficient use of water. The two nozzles also minimize the level of dirt trapped, making it more hygienic. This toilet meets the CSA B45 requirements and guidelines. The toilet is a china vitreous construction. This advanced piece of toilet coded as G500 comes packed with an inbuilt toilet offering a compact design. The double max cyclone system promises a flush of between 0.9 and 128gpf. The toilet system uses the force of gravity together with a cycle bowl to do the cleaning. The bows are designed in a way that they are very easy to do washing and does not clog dust. The main features for this toilet include both rear and front warm water cleaning with adjustable pressure and temperature controls. The toilet also features warm air drier, auto air deodorizer, illuminated air pad, operated through a remote controller, two user memory, auto flush, and a 12inch rough-in. The best Toto toilet comes packed with both the connection and mounting hardware. 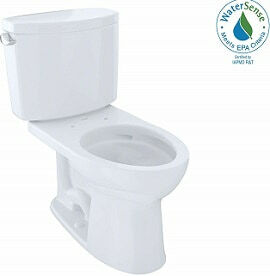 The toilet is compliant to ADA specifications and it is made to a universal height. If you looking for toilet fixtures that will do it with ease and yet beautiful, this is the option. 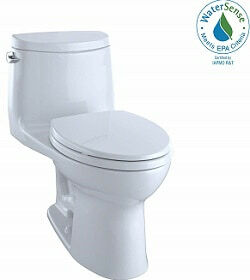 Aquia Dual Flush Elongated is a cotton-white toilet. Like the name suggests, it comes in two pieces but delivers convenience in a way that creates a good experience. 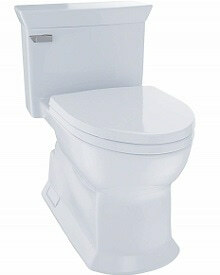 This toilet is simple, made from quality material and is packed with 1.6gpd and 0.9gpf power options to choose from. Putting together is easy. It is also easy to disassemble or do the cleaning. The toilet comes in a sleek beautiful design, giving you the relaxation and comfort to stay there as long as you want. 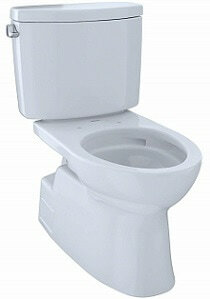 The Supreme Toilet is a low consumption product, with a siphon jet flushing ability of 6 Lpf/1.6 Gpf. 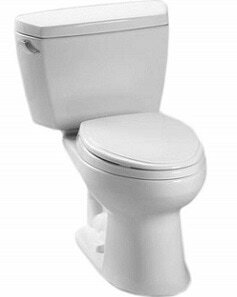 The main features of this toilet include a SoftClosse seater, the trip lacer is chrome plated, and a tank cover. This toilet is loved because it is silent yet it has a powerful flush. The water surface is wider, and it is fully glazed trapway. The Supreme Toilet has a wider flush valve of 3 inches compared to the smaller traditional 2-inch flush valves. The SoftClose seats offer unmatched ergonomic flexibility for the users. This means that the seat position can be lowered gently to the bowl, using the hinge system. The seat also adopts the most advanced and recent technologies including high gloss polypropylene, moulded bumpers, and the ergonomic design. The toilet is built from a high-compact, solid plastic. The toile is constructed to avoid injury and to do away with the common toilet seat slams. Eco Drake Two-Piece Toilet is the last recommendation in my list. This is a premium product with high quality bold. It is well packaged just like other Toto products. It is very easy to assemble and begin to using immediately. It is a low consumption toilet. Features a chrome trip lever, less supply, 10-inch rough-in the toilet is a universal height. This toilet does not come with the toilet bolts, and a wax ring to assemble. Toto is a popular brand because of the guaranteed quality. 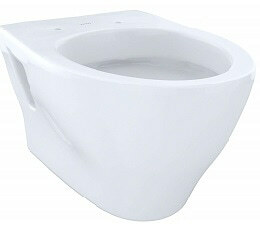 Best Toto toilet is made from quality materials, modern technologies, and are designed for the eye. There is always a toilet specification to meet everyone’s needs. Toto toilets are no doubt the leading certified an ADA recognize brands in the market. These toilets will not only stand longer than most of its peers they are also beautiful, have embrace technology are easy to use. The discussed choices above are some of the best options in the market today to select from. This list not only makes your work easy; it helps you go for value for your money. Always buy from reputable retailers to enjoy your warranties, genuine products and at right prices. Bathroom industry has intense competition, and it may be daunting to pick an excellent product and brand. TOTO has however proven to be a prominent manufacturer, with low to high budget products. Customer tastes and preferences notwithstanding, TOTO’s products are innovative to satisfy every customer’s needs. There is no need to have old, unattractive toilets when you can take advantage of efficient and cost-effective TOTO toilets. Ranging from standard to sophisticated, and automatic versions to make your choice of the excellent TOtO toilet easier. Toto is one the most popular and leading manufacturer of toilets globally and easy to install. 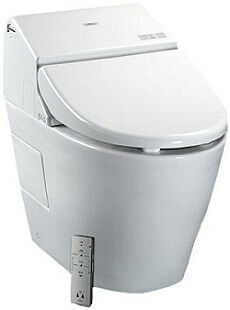 Toto manufacturers a wide range of toilets for a wide range of specifications and user needs. The Toto toilets can be fully automated, highly complex, simple or just a standard toilet. One thing stands out though, the best Toto toilet offers excellent quality. Toto uses a highly advanced technology to manufacture the plumbing products and to help improve the lives of people it serves around the world. Toto significantly invests in research and development, to always remain on top in regards to producing the best quality products in the market. Toto Company has mastered the art of appreciating its employees by creating a conducive working environment. This way, the employees are motivated to be highly productive, giving their best at work. Toto has the priority to always provide a great experience to its consumers and to deliver the best customer experience. Toto is conscious of the environment in its operations. The company has integrated systems to respect and preserve the environment in its operations and production processes. Even though Toto is truly the top and the number one manufacturers of toilets, there is stiff competition in the industry with thousands of brans in the market. Even the most experienced plumber would find it difficult to identify the best product. However, with Toto, one is guaranteed to offer the top product. Toto is a globally recognized brand in regards to the manufacturing of bathroom products. Its innovativeness and unique technology sense make its products postmodern, high quality, and all round amazing. From its standard toilets to high-tech toilets, you are assured of zero disappointments upon purchase. That said, it is imperative that whenever you set out to purchase a Toto toilet, first take note of the features that define your tastes and preferences to avoid unnecessary confusion. Of the five products highlighted herein, they vary in terms of size, seats, and overall user luxury. Some are dual flush, some are automated, and others are hard to install. Use this guide as a measure of which among the best Toto toilets discussed suits your taste and budget.